Heat exchangers at Enwave's John Street Energy Transfer Station, part of a battery of 36 exchangers tasked with draining heat from downtown towers into lake water bound for Toronto's drinking water system. 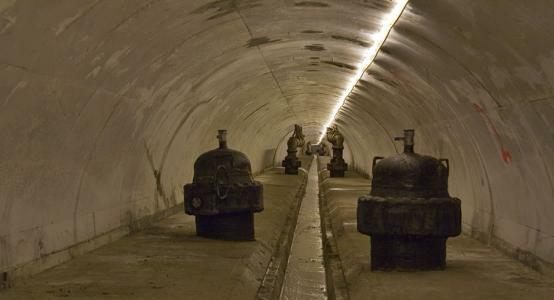 Beneath downtown Toronto, an extensive system of tunnels installed over the last decades supplies cooling to office towers and institutional buildings. 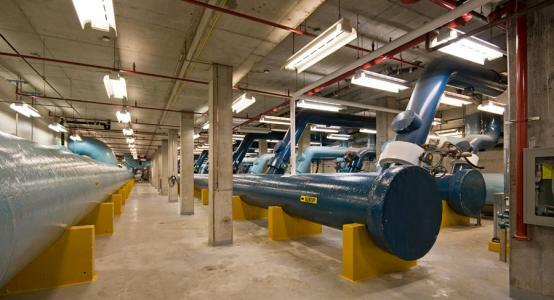 But DLWC is a lot more than those distribution tunnels: the system relies on two physical plant buildings, infrastructure at the Toronto Island Water Filtration Plant (that I haven't seen, unfortunately), and a five-km-long intake system that draws 4°C water from 83 metres below the surface of Lake Ontario. 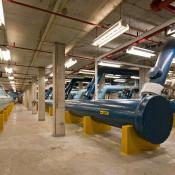 The system contains at least two significant innovations in Toronto's relationship with water. First, the core design of Enwave's cooling system relies on and is extensively integrated with a portion of the city's drinking water supply system, and represents the first recognition since the 1800s that there might be collateral uses for that great endeavour of public works (I'll have more to say on this subject in another forthcoming article). 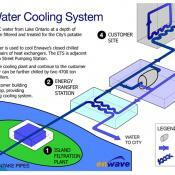 Second, although a little more ancillary, Enwave's backup chiller plant at Simcoe Street sinks its waste heat into water drawn from a stormwater storage well. This well, fed by storm sewers beneath Simcoe St. and Bremner Blvd., presents another argument that we could be doing a lot more with our sewage and stormwater than just piping it away as quickly as possible. This isn't the first time I've written about Enwave's Deep Lake Water Cooling system: last summer I published a pair of articles that questioned the invisibility of the distribution system, both when it was being installed and in its completed state today. To the company's credit, when I contacted them shortly after the publication of those articles, their response was "We're happy to show the system to anyone who asks." The problem of the system's physical obscurity appears to have little to do with any internal policy or attitude at Enwave—the organization clearly takes a great deal of pride in its physical systems, and I get the sense that they would love to give the public the chance to learn about them. Instead, there are issues with Toronto Water's backward, post-9/11 policies on public access: the Energy Transfer Station, easily the most physically accessible part of the DLWC network, and a great Doors Open candidate if there ever was one, shares space in the city's John Street Pumping Station. On top of this bureaucratic obstacle, there is the inexcusable cost of contemporary event insurance, and the assumption that is held today in far too many offices in our cities that authorities and managers don't have a responsibility to give the public a view into the infrastructure on which urban living depends. Despite all these obstacles, and the fact that the system is fully subscribed and in no need of marketing, Enwave was happy to show their plants off, and was even polite enough not to complain about my previous, unsanctioned photography of their distribution network. 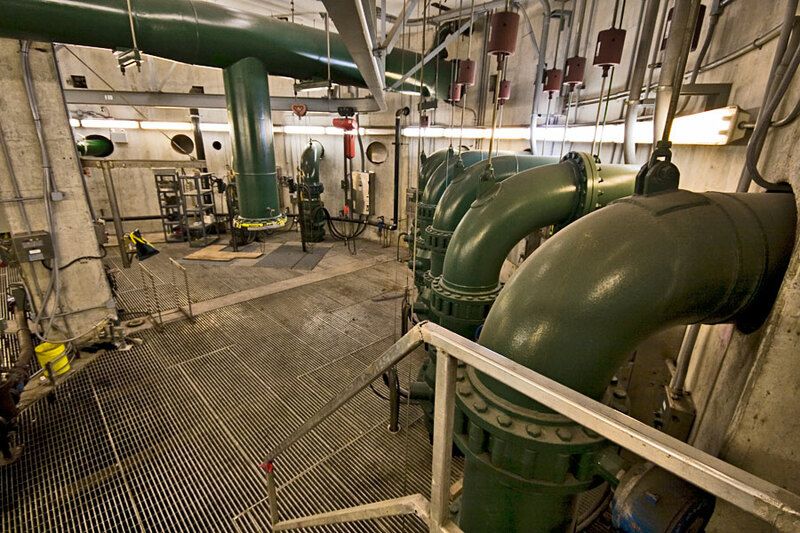 Now, a view inside the plant infrastructure and the innovative relationships with water that make the DLWC system possible. 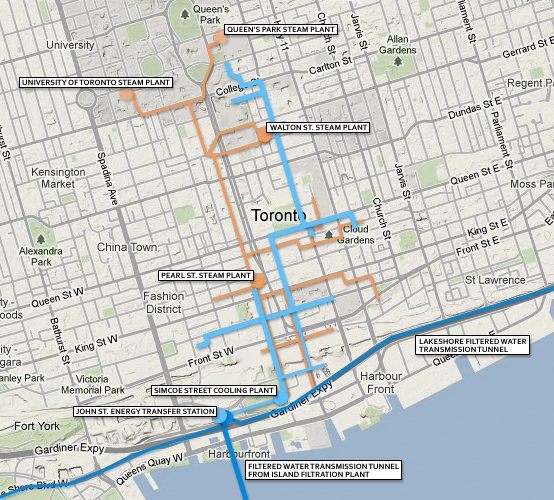 The above map shows the general layout of Enwave's Deep Lake Water Cooling system (light blue) and its interface with the City of Toronto water supply system (dark blue). Also shown is Enwave's district heating system (orange). Enwave began as the Toronto District Heating Corporation, an amalgamation created in the 1970s and 1980s from smaller steam networks previously owned by Toronto Hydro, the Toronto Hospitals Steam Corporation, the Province of Ontario, and the Toronto Terminals Railways Corp. The late 1980s saw the first proposals to develop a cooling system based around water drawn from deep within the lake, but it would be more than a decade before this plan began to be realized. 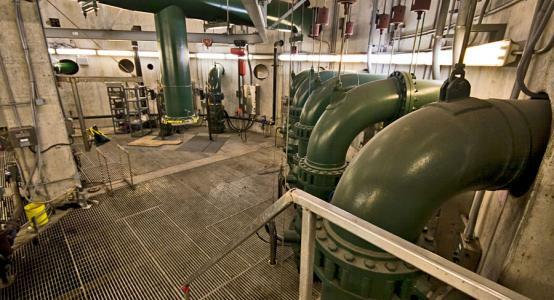 In the late 1990s, Enwave opened its chilled water plant at Simcoe Street, and in 2003 succeeded in sinking the new intake pipes for the Island Filtration Plant that allowed for the implementation of deep lake cooling. 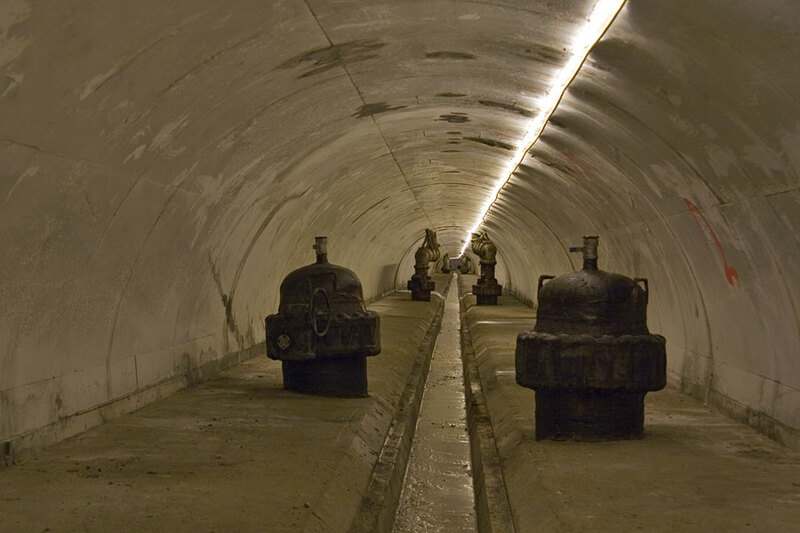 Cold water is drawn from the lake through these new intake pipes, run through the drinking water filtration process at Toronto Water's Toronto Island Filtration Plant, and then transmitted beneath the harbour to the city's John Street Pumping Station through a brick-lined tunnel installed in 1908. 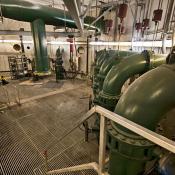 Enwave operates an energy transfer installation at the pumping station, where the very cold water coming from the lake runs through a battery of heat exchangers where it can accept heat from the water contained within Enwave's closed distribution loop. 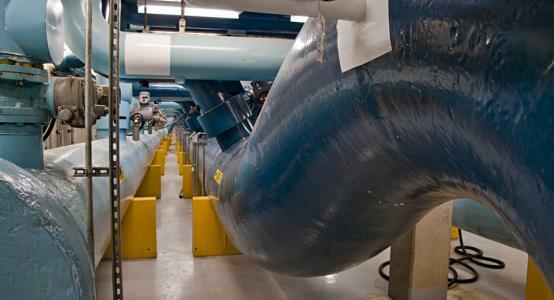 Enwave's water, chilled in those heat exchangers, is sent east to the Simcoe Street Cooling Plant, where its coldness may be augmented in peak periods by conventional gas and electric chilling turbines, and then pumped through the company's network of distribution tunnels. 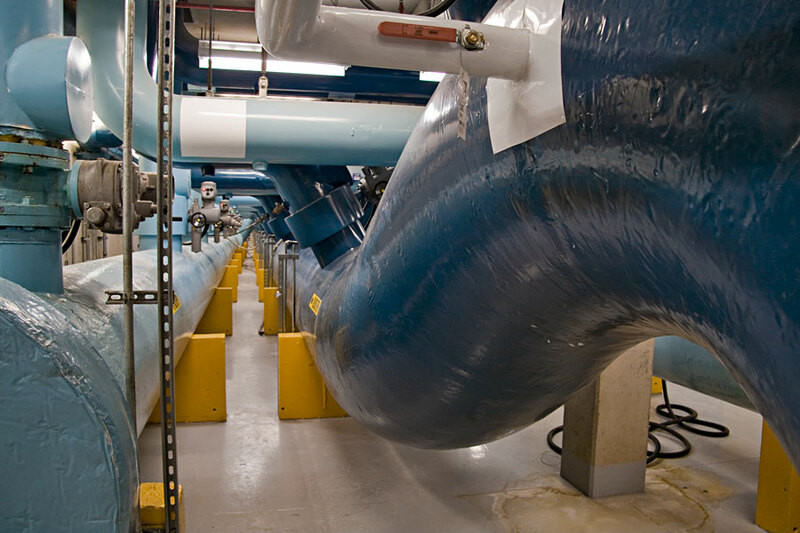 Each client building has its own heat exchanger, where cold water from the distribution network chills the water in the building's own closed internal loop, before ultimately returning to John Street to be chilled again. John Street is where the 'magic' of the system happens. 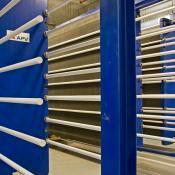 Cold, 4°C water drawn from the lake and filtered at the Island plant is pumped through 18 headers, each leading to a pair of heat exchangers (36 in all). In an entirely separate loop, water returning from Enwave's DLWC distribution system enters the exchangers, dumping its heat into the city water (which would otherwise have to be warmed by other means). Drinking water ends up leaving John Street at 12.5°C, while the temperature of Enwave's outbound system water drops to 4.5°C. 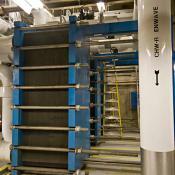 Each heat exchanger contains thousands of thin metal plates. In between these plates are a honeycomb of intermediate spaces that produce two completely separate pathways: water from the drinking water system flows through one pathway, while Enwave's distribution water flows through the other pathway, and as Enwave's water moves through the exchanger its movement and friction against the metal plates transfers heat first to the adjacent plate and then to the cold lake water on the other side. 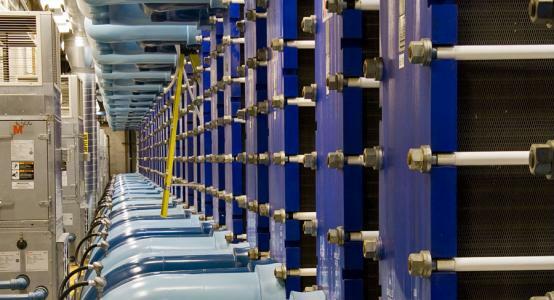 While the physical structure of the heat exchanger is designed to prevent leaks, additional protection is created by keeping Enwave's side of the exchange at a significantly lower pressure than the city water—any leak means city water entering the Enwave loop, rather than vice-versa, protecting the water bound for the drinking water system from contamination. 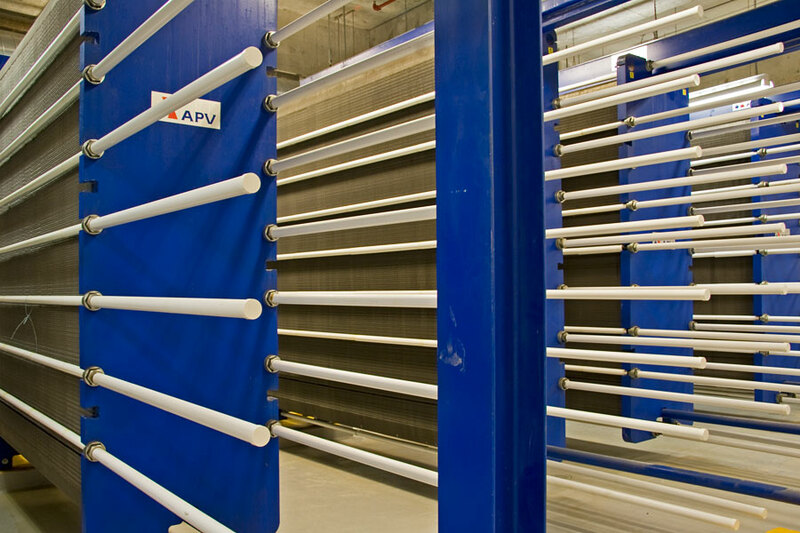 The system (including the conventional chillers at Simcoe Street) replaces approximately 75,000 tonnes of conventional chiller capacity that was once installed in the individual buildings that are now Enwave customers. 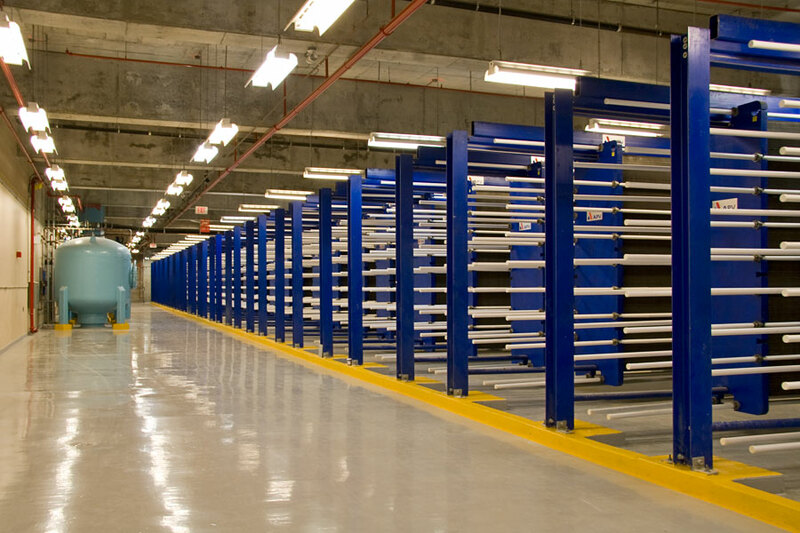 Obviously this is a much more energy efficient way of delivering cooling to large buildings, and Enwave's customers have been able to reap additional windfall savings by not having to replace their own aging chillers. Within a few years of the system's launch in 2004 it was fully subscribed. 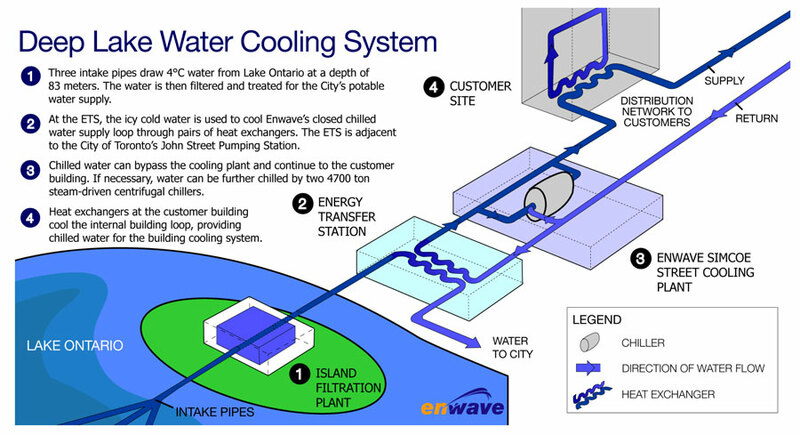 Enwave apparently has plans to add additional capacity by installing another intake in the lake, in this case bypassing the city water system entirely and running its own lake water loop through a new set of heat exchangers and then back out to the harbour. While it undoubtedly makes sense on grounds of logistics (the city has no need to expand the Island Filtration Plant any further, and the other plants are too far from Enwave's core market in the downtown), cost (ensuring there is no cross-contamination of the potable water loop by Enwave's system water is no small feat), and convenience (this expansion wouldn't be subjected to the same restraints and bureaucracy required by Toronto Water), it is still unfortunate to see the company move away from the fantastically creative model of 'cogeneration' and infrastructural synergy that underpins the original system. 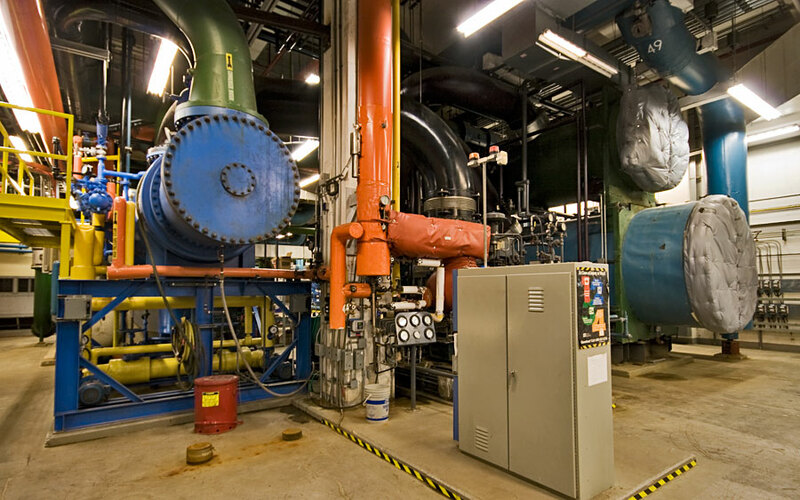 Generally 'cogeneration' gets used to refer to the dual-use of steam generation systems, so that the steam produced by a boiler gets used both to heat buildings and to drive turbines that generate electricity. 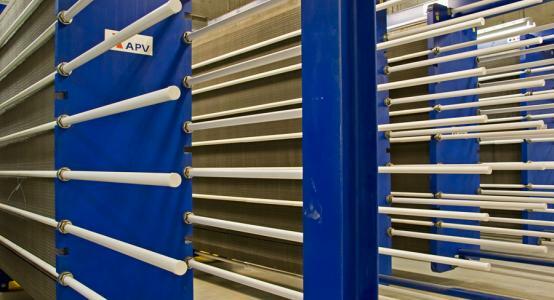 In Enwave's case, we have a different kind of cogeneration, in which water being harvested from the lake gets used twice, first for cooling and then for potable water. It's worth noting that using municipal drinking water for something other than drinking isn't an altogether new invention—in the early years of centralized water supply in North America, water from pressurized systems got used for all sorts of things, including driving elevators and industrial machines—and this is a subject I will return to in a few weeks. We should be able to do more than one thing with infrastructural systems that are as spatially extensive, and as energy- and ecologically-intensive as these systems are. 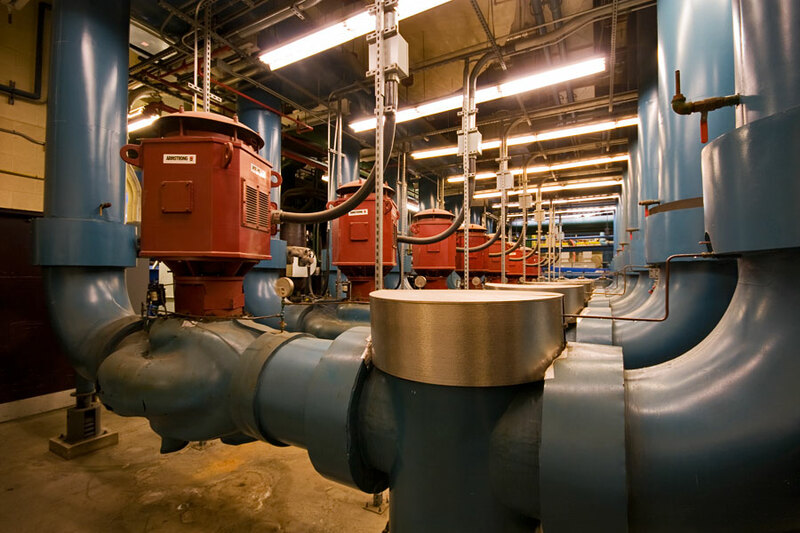 While Enwave's DLWC is a great advance over conventional chillers, the costs of construction, the electricity that runs the pumps, and the treatment chemicals used to condition the water within the system are not insignificant. The same is true to an even greater extent of our chlorinated, fluoridated water supply and the wastewater that comes back out the other end through our sewers. We need to work harder to spot opportunities to marry these discrete systems, and to find ways to do what Enwave has done in places that are less dense and further from the lake, but never more than a few blocks from a major city water distribution line. 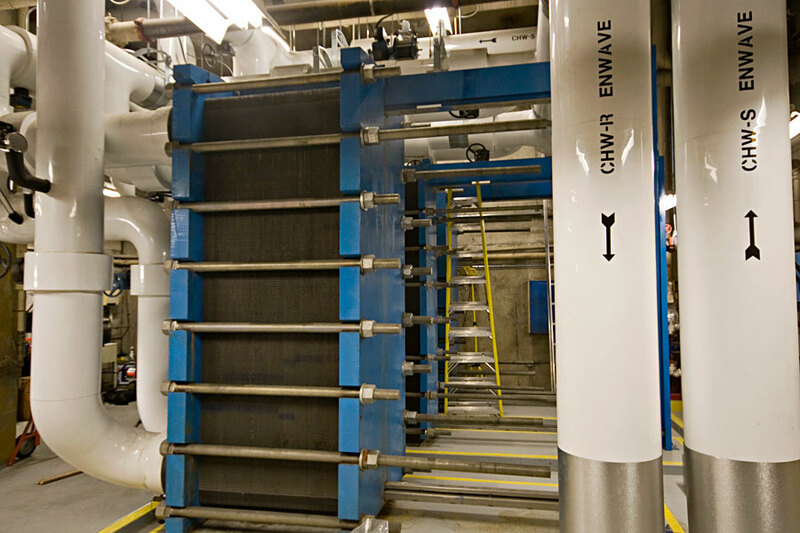 On leaving the John Street Energy Transfer Station, Enwave's newly-cooled water is drawn east to a Chiller Plant at Lower Simcoe Street, at the southeast corner of the Metro Toronto Convention Centre's parking garage. 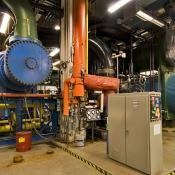 The plant at Simcoe Street was installed in 1997 to supply cooling to the Metro Toronto Convention Centre using conventional steam absorption chillers; updated with gas and electric chillers it remains in use as a peaking and backup plant for the DLWC system, providing additional conditioning on summer days to lower the temperature of outbound water to about 3-3.5°C. 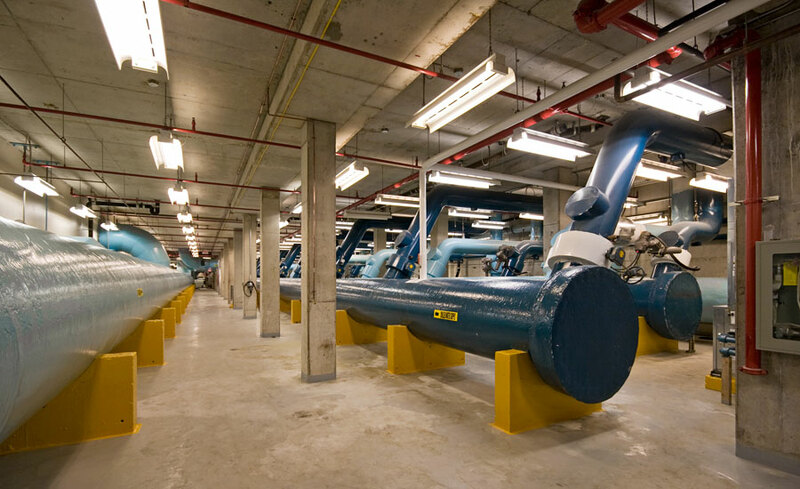 This installation is also where the main pumps for the system are located—two batteries of electric pumps drive cooling water up through the distribution network as far as Queen's Park, north of College Street. 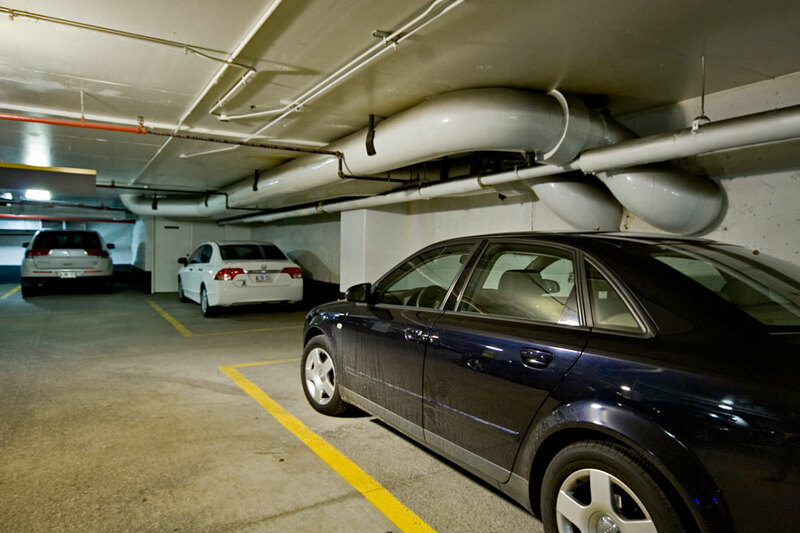 Because the south building and garage of the MTCC is located beneath the historic Roundhouse and surrounding park, there was a desire to avoid having to install the typical large, industrial cooling tower that would have once graced the rooftops of most of Enwave's DLWC customers. 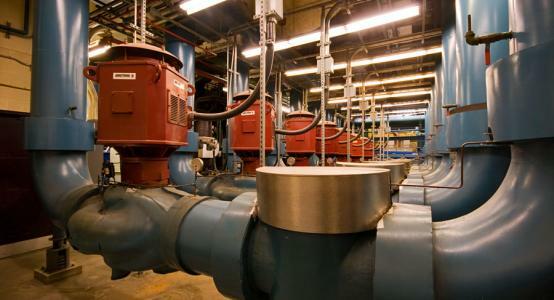 Instead, the waste heat from the condenser stage of the Simcoe plant's mechanical chilling is dumped into filtered stormwater that is pumped from a stormwater storage well located inside the curve of the MTCC's south loading ramp, in the southeast corner of Roundhouse Park. Storm sewers from Simcoe Street and its adjacent road network empty into this well, where the water is mechanically filtered before being pumped to the plant's condensers. Again, this is an elegant solution to the ubiquitous problem of where to get water and how to cool things, and rather than being seen as the consequence of a particularly unique or limiting set of circumstances should be viewed as evidence that we could be doing a lot more with our stormwater. 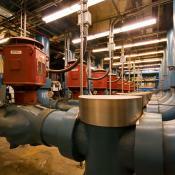 Where else could we be using sequestered stormwater or combined sewage as a heat sink? In Toronto's wastewater system there are dozens, if not hundreds of significant-volume siphons, sedimentation pools and storage chambers, and I wonder how the cost to leverage these underground resources, ammortized over suitable time periods, would compare to conventional cooling (or geothermal heating, for that matter, imagine the heat we could be harvesting from our combined sewer system in winter). 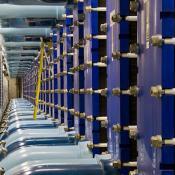 The tunnels of Enwave's chilled water distribution system have already been covered extensively on this website. 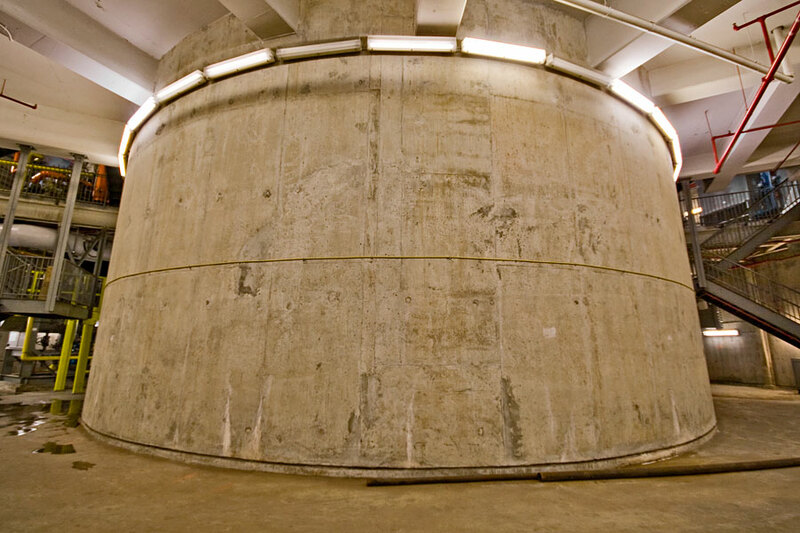 Comprising some 4.3 km of bored tunnel beneath the downtown core, the network is as significant an underground structure as Toronto's downtown subway or PATH (pedestrian) tunnels. While I had spent a significant amount of time exploring and photographing Enwave's distribution system, it was only recently that I got to see what things look like inside customer buildings like the office tower at 181 University Avenue. 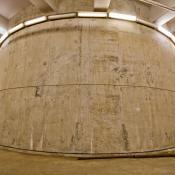 Customer buildings are supplied by riser pipes that are connected to the supply and return lines buried beneath the floor of the adjacent tunnel. 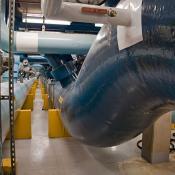 Some of these connections may supply more than one building where they are conveniently close together, and this is the case at 181 University Avenue, where a system connection and a shared installation of heat exchangers supplies cooling for both 181 and the adjacent National Bank Tower at 150 York Street. 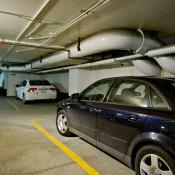 Two discrete white pipes emerge from an outer wall of the 181 parking garage and run to the corner of the garage, where they drop down to a mechanical room in the sub-basement, the site of the buildings' heat exchangers. These exchangers are basically smaller versions of the ones down at the John Street ETS, and they perform the same basic function using the two closed loops of water: one is Enwave's distribution loop, the other the internal cooling loops for the two towers. Having captured heat from the customer's building, Enwave's distribution water is then returned through the distribution tunnels, back to John Street to dump this heat into water destined for the drinking water system, starting the cycle anew. While the basic idea of Enwave's DLWC system received significant media coverage around their initial launch, I'm not sure whether the full implications of what they accomplished have ever been properly discussed. Setting aside the various isolation loops, functionally DLWC creates an entirely new relationship with the lake for many of the several hundred thousand people who work in downtown Toronto, as well as some of the smaller but growing number that now live there. 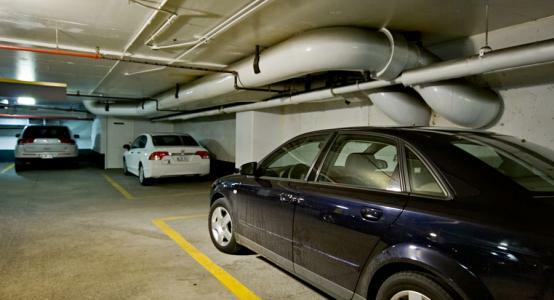 Enwave DLWC service should be more than a simple bullet point on each property's list of sustainability measures; it is an opportunity to imagine a new connection with the lake, snaking up through piping in the base of each building. 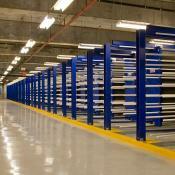 On a system scale though, Enwave is equally significant. 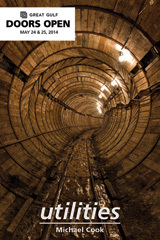 DLWC repurposes one major infrastructure system, Toronto's drinking water supply system, to accomplish something completely different—this doesn't happen very frequently! While, as it ponders expansion, sound business considerations may be pushing Enwave away from the kind of collaborative, cogenerative approaches to infrastructure and service provision that somehow got realized in the design of the initial system, I wonder if it isn't time that we started applying these approaches to other places and other problems, and not just in the core but throughout the city. 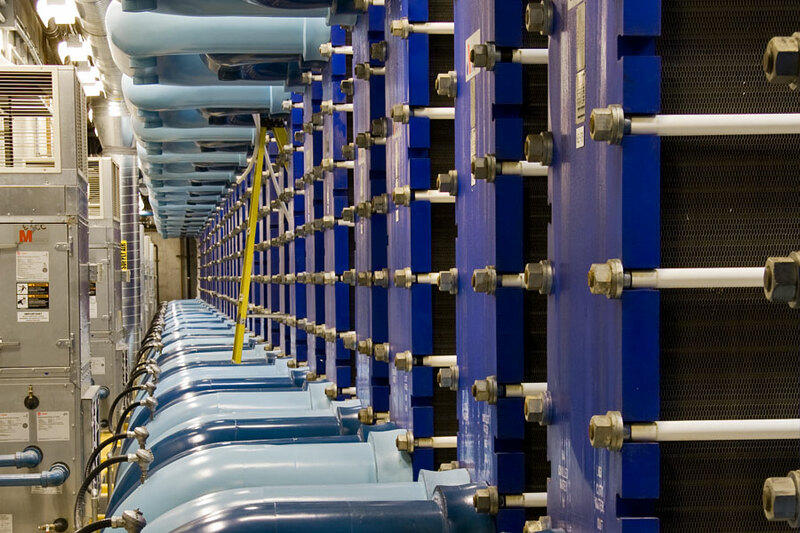 Deep Lake Water Cooling is not the only forward-thinking, collaborative approach to infrastructure that city-owned agencies have dabbled with in the last two decades, although unfortunately many of the others haven't been allowed to succeed in the way Enwave has. One example I'm thinking of here was Toronto Hydro Telecom (THT), which in 2006 combined its existing high-speed fibre optic network with Toronto Hydro-owned streetlight poles to blanket the downtown core with a meshed wifi network ("One Zone"). One Zone's potential has unfortunately been squandered as a result of an unnecessarily steep pricing structure and the 2008 sale of THT to a privately-owned cable company. There are clearly some great opportunities to explore and effect these kinds of combinations, but the challenge is working out how to combine the flexibility and low political cost of the entrepreneurial model that has been employed at both Enwave and THT with some kind of commitment to a broader vision of public access and public benefits that extends beyond the wealth and privilege of the downtown core. Bay Street and the valuable lands along the waterfront should not be the only places in Toronto where we can make these kinds of innovations happen. Looking deeper into Enwave's infrastructure, it's clear from both DLWC itself and the stormwater well in use at Simcoe Street that there is the potential to do a lot more with our potable and wastewater infrastructure than simply feeding it into a few water features in public parks. With imagination, our sewers, drinking water, and other infrastructure networks can be integrated back into the city's ecology and economy at multiple scales in order to serve a variety of ends. Rather than simply piping water away (in both directions, both upstream to end-users, and then downstream, as wastewater, to treatment plants and outfalls), we should be making it useful in our productive landscapes, and we should be making it a clear, conscious, visible part of our experience and understanding of how our cities function.